How Do Rattlesnakes Mate and Reproduce? 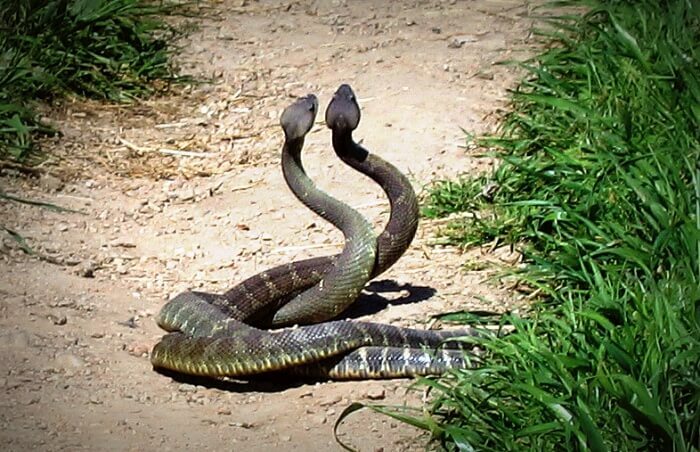 Rattlesnakes reproduce sexually, with the males using their paired hemipenises to inseminate the females. Unlike other snakes that lay eggs, female rattlers are ovoviviparous, allowing them to incubate the fertilized eggs within their bodies and to give birth to live young. Rattlesnakes belong to a family of venomous reptiles that inhabit the prairies, marshlands, rocky hills and deserts of the North American and South American continents. In the United States, these animals are predominantly found in the southwestern region. Breeding in rattlesnakes typically begins in the spring. After successfully mating with the male species, female rattlers usually store the sperm for a period of time before allowing fertilization to occur. They generally gestate over the course of 90 days before giving birth in the fall. The young can fend for themselves just minutes after delivery.